With Helenio Herrera as manager, a young Luis Suárez, the European Footballer of the Year in 1960, and two influential Hungarians recommended by Kubala,Sándor Kocsis and Zoltán Czibor, the team won another national double in 1959 and a La Liga and Inter-Cities Fairs Cup double in 1960. In 1961 they became the first club to beat Real Madrid in European Cup competition, but lost 3–2 to Benfica in the final. The 1960s were less successful for the club, with Real Madrid monopolising La Liga. The building of the Camp Nou, completed in 1957, meant the club had little money to spend on new players. On the positive side, the decade saw the emergence of Josep Maria Fusté and Carles Rexach, and the club won the Copa del Generalísimo in 1963 and the Fairs Cup in 1966. Barça restored some of its former pride by beating Real Madrid 1–0 in the 1968 Copa del Generalísimo final at the Bernabéu, in front of Franco, with former republican pilot Salvador Artigas as manager. 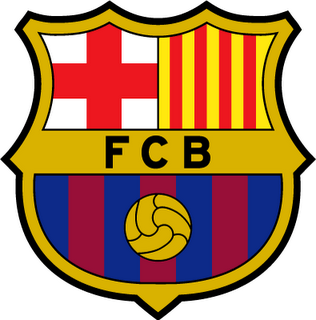 The end of Franco's dictatorship in 1974 saw the club changing its official name back to Futbol Club Barcelona and reverting the crest to its original design, again including the original letters.